With four Masters of Wine now living and residing in Asia, the first person to receive Master of Wine title was Jeannie Cho Lee MW. She is an award-winning author, television host, editor, wine critic, judge and educator based in Hong Kong. Her pioneering #1 Asian Cuisine Wine book Asian Palate book 2009, explores wine and Asian food pairings. It has won many awards, including the Gourmand Award for Best Food and Wine Pairing Book in the World in 2010. Her second book, Mastering Wine for the Asian Palate (2011), introduces a new set of Asian wine descriptors for major grape varieties and wine styles. 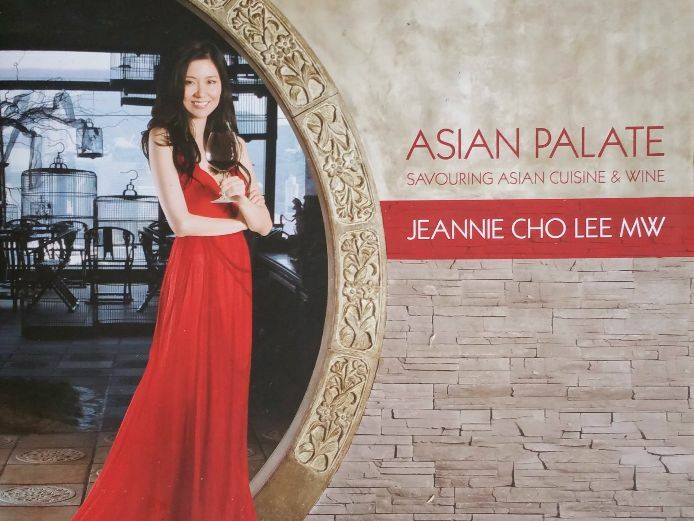 Visit her website Jeannie Cho Lee where authentic Asian Cuisines and wines are celebrated together; mastering wine, food trends, pairing guide and taste notes database are just a few highlights. 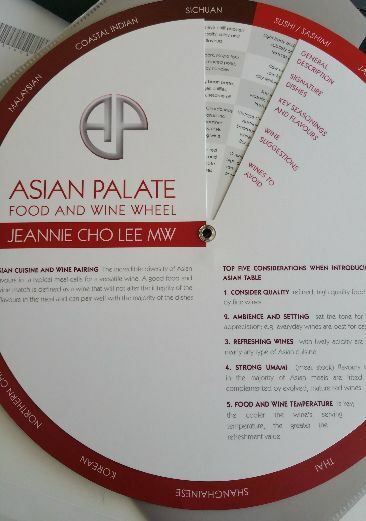 Jeannie has developed an Asian-oriented Food and Wine Wheel with wine recommendations for various southeast-Asian cuisines, which I ordered online directly through Jeannie Cho Lee website. I genuinely can recommend her first book based on 5 valuable reasons. The content is exceptionally informative about the pairing of Asian cuisines with old and new world wines. Why? It definitely is a first book, where Asian ingredients and terms are truly introduced to the language of wine. The popularity of Asian cuisines rising up all over the world from fine dining to trending street food restaurant and food truck outlets. The use of typical sub-tropical ingredients showcasing native dishes. A lot has been written and said about wine pairings with Asian cuisines, but never from an Asian point of view. The Asian perspective, this book brings a wide-angled view focusing on Asian cuisines mentioning specifically ingredients in dishes and cooking styles. Typical native ingredients tied to Asia which you will not come across Europe or other Western parts of the world. Illustrating regional cuisines with wine consideration, recommendations and what to avoid. This by itself is significantly refreshing, instead of the boring and copied standard advice to choose for the outdated choice of sweet wines. Important to realise, as the wine is approached by appearance, nose and taste, the visual value is made by alluring food photography. In effect seducing the eye and wetting the palate. Appetising food photography of wine and Asian cuisine, along with snapshots of the location and introduction of the regional or national cuisine. Not the last or least reason, the value, this should have been on top but then it wouldn’t make any sense without the introduction. The western approach is often to match one wine with one dish, this is difficult in reality with food served on the Asian table. A simple bowl of rice is often accompanied with at least 10 different dishes in Korea. A humble Chinese meal at least with 2 dishes and a soup not counting the small sides or a festive banquet dinner of many courses. While a perfect pairing between an Asian meal and wine is often possible, Jeannie has identified among Asian wine and food lovers four key consideration: –versatility, umami character, intensity and quality – when matching Asian cuisines and wine. Jeannie Cho Lee MW. Singapore is highlighted featuring the national poultry classic dish, here’s my Hainan Chicken post with the recipe. Or click for Thai famous beef salad Yum Nuea instead. She also collaborated with the German Wine Institute, launching the 52-page book in November 2011, for a full read here’s the article link: “Perfect Pairings: German Wines and Asian Flavours“. The German Wine Institute Dutch brand office hosted a book launch event held in Amsterdam where Jeannie presented the book during luncheon with Dutch-Asian Chefs and Restaurateurs. I stumbled upon this online Dutch review article Smaak van Wijn (Dutch readers only, no translated transcript). For more information on how to obtain a book copy, visit the German Wines website. The site also offers an online shop with interactive web-based food and wine pairing tool with other helpful accessories. Most importantly it has tonnes of information how to discover, experience and enjoy German Wines with wine travel tours and tips. Asianfoodtrail.com is a lifestyle blog about life, travel, food and more. Find a recipe for a great home-made dish or read more about travel tips to the East. You will find easy reads on daily slices of life, reviews of handy tools and gadgets, and all that we find along the way on our asianfoodtrail. This site contains affiliate links from Amazon, Gourmet Ads, Health Ads, other blogger’s content (e-books, classes & more) and other companies. By purchasing through these links Asianfoodtrail earns a small commission, however you pay the same price for the item (it does not increase). The full disclaimer and disclosure transcript link can be found on the left sidebar or click here. ©Asianfoodtrail – Unauthorised use and/or duplication of this material without express and written permission from this article’s author and/or the blog’s owner is strictly prohibited. Excerpts and links may be used, provided that full and clear credit is given to www.asianfoodtrail.com and Asianfoodtrail Blog with appropriate and specific direction to the original content.